It’s a a pretty cushy way to travel, I have to say. 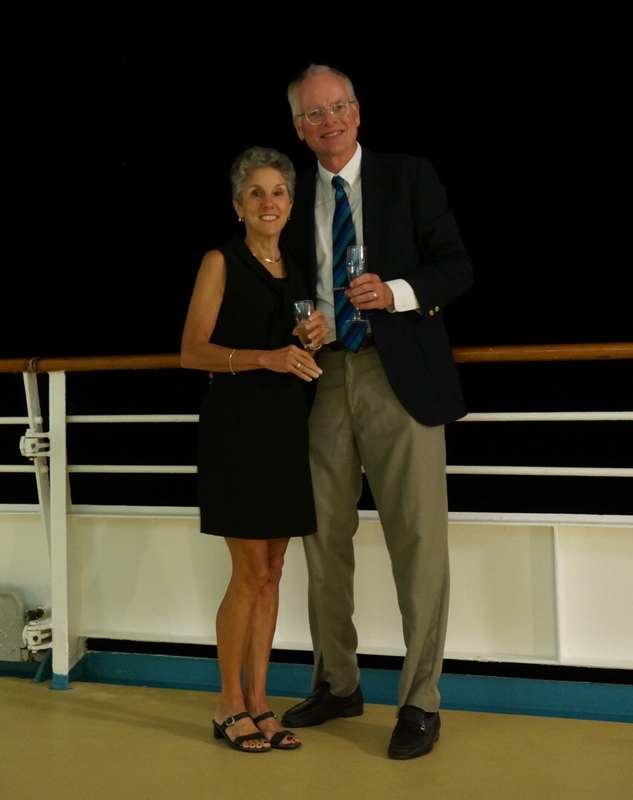 For all the traveling we have done in our 32 years of marriage, not to mention our respective college European travels, this is only our second cruise. And as I sit in my deck chair in the warm sun, with the sea breezes to keep me comfortable as we sail, I must admit it has its appeal. My room is not far away. And I haven’t had to pack and unpack in nearly a week. We treated ourselves pretty well when we booked our room this time, moving up several levels into prime territory. 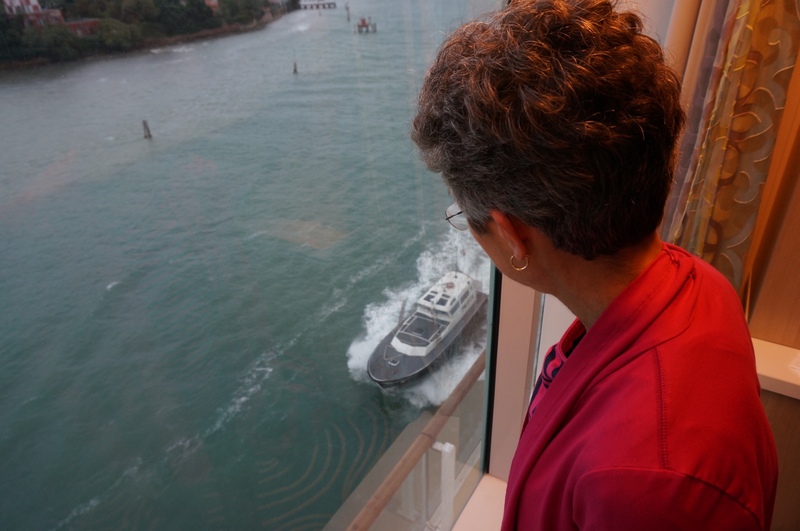 Cruise ships have gotten smart, providing private balconies for nearly all the upper level rooms. 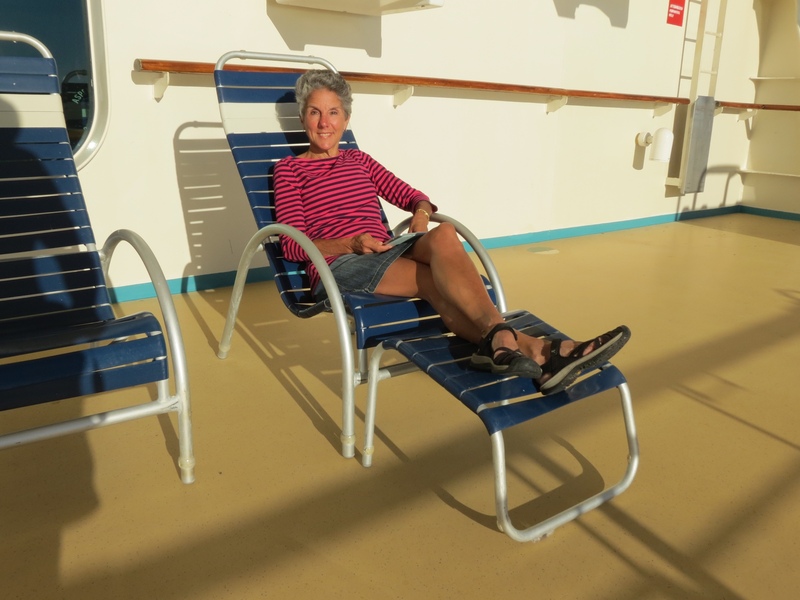 It was a tempting option, but instead we opted for a room without – primarily to secure a more stable position smack in the middle of the ship. I was most thankful for that choice when our ship was rocking and rolling on our first day out of port. And with so many outdoor areas for lounging, we rather prefer our enlarged indoor sitting area and huge windows right over the water. In fact, that position gives us an up close view of some nautical action. We are situated directly above the ship’s gangway, the same entrance used by local pilots who are required to maneuver the ship in and out of port. They are delivered to and from the ship on a small boat and we just happened to see such a rendezvous after departing Venice. We were fascinated to watch the pilot boat sidle up alongside us, match our speed and then duck under the curve of ship to collect the pilot. When it pulled away, there was the pilot climbing down the ladder over the small bow of the boat. Once we knew we had this front row seat, we watched similar performances at other ports. 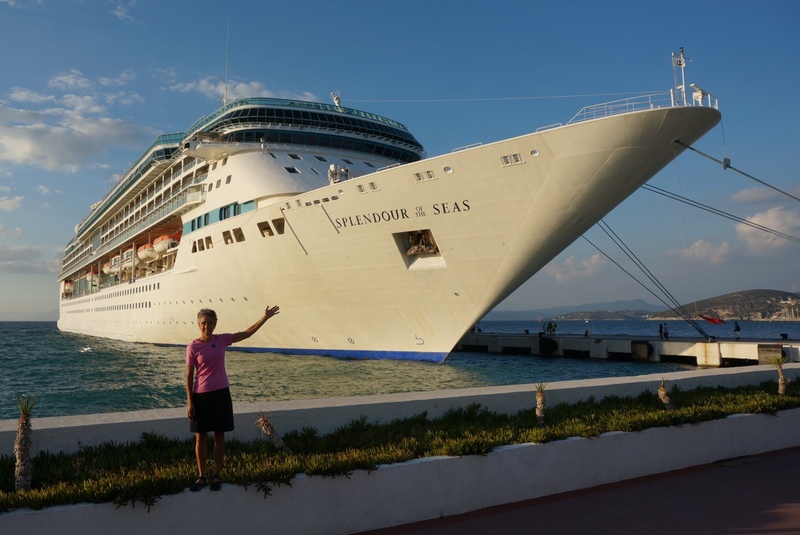 It is impossible to go hungry on a cruise ship. With all the food offerings, it could be a continual feast but instead we restrain ourselves so as to finish the trip the same size we started. A hearty breakfast gets us through the day and we look forward to the elegant dinner that awaits in the main dining room. We are assigned to a table of 10, which feels unwieldy at first. 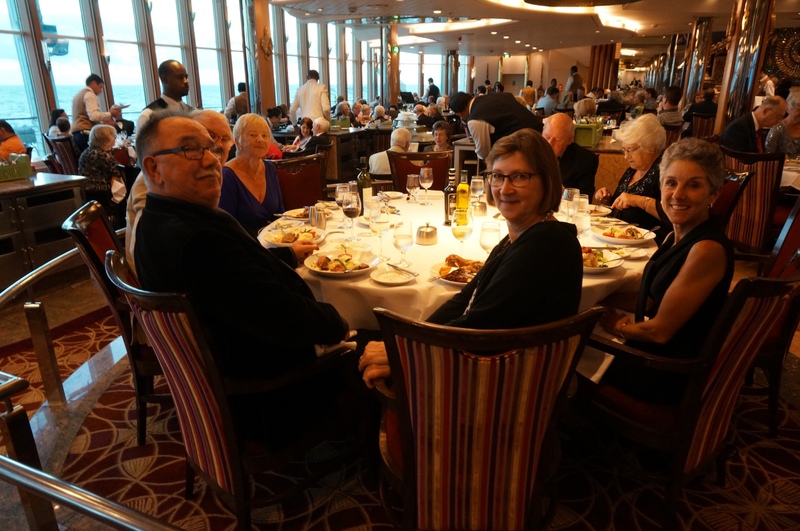 But with each couple hailing from a different country, lively conversations result and we enjoy our new dining friends. At first I bristled at the idea of two formal nights. What a hassle, I thought, having to add two fancy outfits and all the accessories to my already overstuffed suitcase. But when the time comes, I not only relent but relish the opportunity to dress up a bit and celebrate. 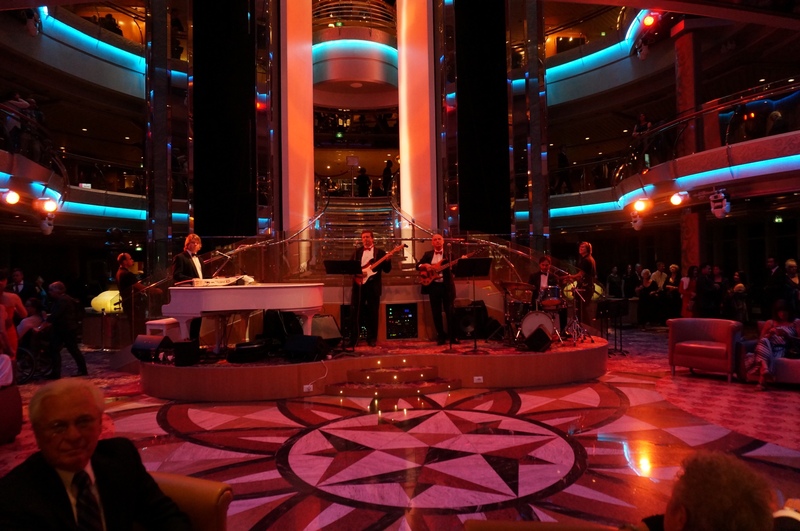 Naturally, the ship wants to sell us overpriced photographs to commemorate the evening. Instead, we opt for our own more unique do-it-yourself shot that Rich rigged up on deck. Not bad! We round out the evening with the nightly show. The headliner acts are very good, bringing in amazing acrobats, humorous string musicians, and mind boggling magicians. These are supplemented by staff musicians and dancers who keep us entertained. They even take to the air with aerial acts in the tall Centrum space. Late night people that we are (not! ), we don’t last much beyond this show. After all, tomorrow is another day, a new destination and a deck chair awaiting. I think we are getting the hang of this cruising thing.